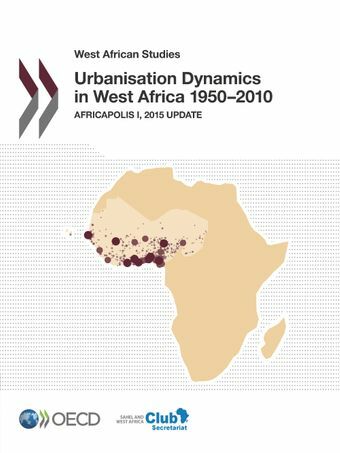 Since 1950, the number of urban agglomerations in West Africa increased from 152 to almost 2 000, and today towns and cities are home to 41% of the region’s total population. Cities and their inhabitants are increasingly shaping West Africa’s economic, political and social landscape. Yet there is little up-to-date data available for analysis and the formulation of development policy at the local, national and regional levels.Africapolis, a comprehensive and homogenous dataset on urbanisation, is a significant step towards closing this data gap. The 2015 update covers 17 West African countries spanning the period 1950 to 2010. Its original methodology combines demographic sources, satellite and aerial imagery to provide population estimates and geolocation at the level of individual agglomerations. The morphological approach adopted by Africapolis helps identify territorial transformation processes which are at the core of West Africa’s complex urbanisation dynamics and can be observed at several levels: metropolises, secondary cities, the merging of villages and the formation of conurbations.The identification of cities with fewer than 100 000 inhabitants is a major contribution of Africapolis – 90% of West Africa’s cities, or a combined population of 45 million people, fall into this category – a figure which underscores the important role of small cities within the urban system. This edition also includes new measurements of urbanisation in Nigeria, Africa’s most populous nation, constituting the most complete dataset on urbanisation dynamics in this country to date. The 2015 Update identifies 1 947 urban agglomerations as of 2010 and the data allows to characterise and track the evolution and territorial transformation of old and new urban centres (population, location, distances between agglomerations, and morphology). The data highlight the importance of small- and medium-sized agglomerations in national urban networks and the emergence of new urban agglomerations through in situ urbanisation. The SWAC Secretariat worked with the e-Geopolis Project on the 2015 update of Africapolis which covers 17 West African countries spanning the period 1950 to 2010. Extensive and updated inventory of agglomerations in Nigeria, accounting for more than half of West Africa’s population.